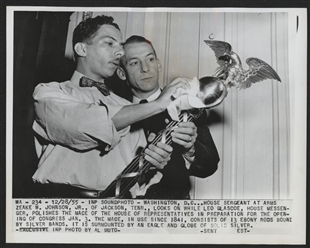 House Sergeant at Arms Zeke W. Johnson, Jr., (right) supervises as House Messenger Leo Glascoe polishes the House mace. The mace, a decorative variation of the fasces, is placed by the Sergeant at Arms on a pedestal at the Speaker's right each time the House convense. The Sergeant at Arms serves as the House's principal law enforcement official, and at the direction of the Speaker, can restore order in the Chamber by presenting the mace in front of an unruly Member.